1.- Who is responsible for the data? 2.- Why have we collected your data? In order to manage your registration as a user of our platform. To identify you as a user, to access your purchase history, your addresses and other data submitted by you in the process of placing an order. Performance of the contract of sale for those products and services that you have acquired through us by using our platform. To contact you by email, by telephone or by other equivalent means of communication related to the performance of the existing contract of sale. To meet requests that you make through customer service channels, by telephone, contact form etc. To send you commercial communications, offers, information about new products or important sector-based news if you have subscribed to our newsletter, or if you have completed our contact form. 3.- For how long do we hold your data? Personal data is held for the time that is strictly necessary in order for contractual obligations to be fulfilled, and in addition for a period of time up to a maximum of five years, this being the retention period arising from the contract. 4.- Will my personal data be shared with any third party other than the data controller? No, it is not the intention of the data controller to share or to disclose your data to anyone outside this company. However, it may happen that in order to comply with a legal or regulatory provision the data collector is required to disclose your information to a judicial, police or administrative authority, among other potential recipients. 5.- What are my rights as a data subject with regard to the processing of my personal data? The right to request access to your personal data. The right to request the amendment or deletion of that data. 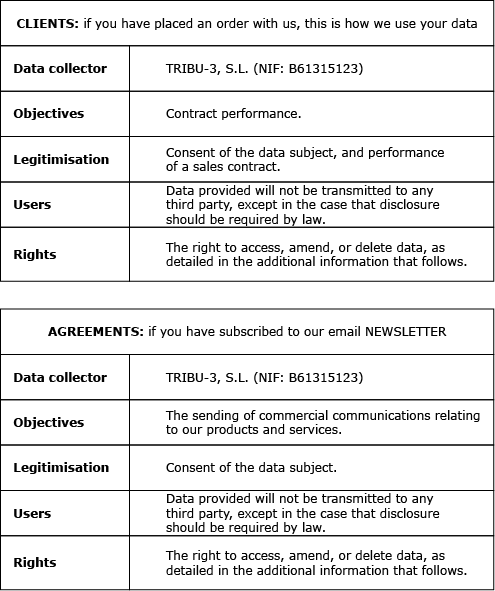 The right to request a limitation on the processing of that data. The right to the portability of that data. By calling +34 93 208 15 30. In either of these cases, with the aim of properly safeguarding your personal data, we are required to confirm your identity by asking for a form of identification, or by means of the confirmation of some of your personal details. Also, please bear in mind that you can lodge a complaint with the Spanish data protection agency (Agencia Española de Protección de Datos) in relation to the exercise of your rights as indicated above, in the case that you consider that we have not provided an adequate response to your request.